A while back we had a clear out of some old t-shirts and Pippa made some strips from them and crocheted together a phone holder. It was very nice and soft and I thought a lovely way of reusing/upcycling the old t-shirts, which got me thinking about other ways to use them. 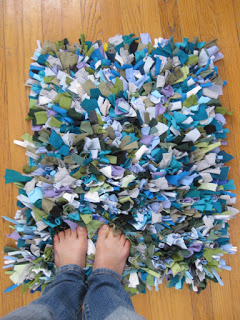 Another method uses strips of fabric which are tied through or looped through a backing fabric to provide a ruffled finish to the rug. I have decided to go for the second method because I think it will provide a much better feeling under my feet. I actually got the inspiration to start this because I found some hessian bags for sale in a local charity shop and decided they would make a good backing. In hindsight I should have either used half of the bag or got a plastic rug mesh backing to use with slightly larger holes… but oh well you live and learn. I started off around the outside first and then started filling in the middle. In an ideal world I would just use fabric from old t-shirts and other suitable clothing, however it’s hard to find t-shirts that are in a wide variety of colours, I would mainly have had a yellow and blue rug with white edging… so instead I may have bought some fabric from fabricland in a wide variety of colours to make my rug look really cool.